Piscine privée Townhome près de toutes les attractions de la communauté de villégiature fermée. Vous pouvez célébrer Mardi Gras toute l'année dans le Three Sisters Villa. Parades et les parties sont disponibles tous les jours au Disney à proximité et Universal Studios. La nourriture est fantastique à quelques minutes de votre porte d'entrée. Vous pouvez toujours échapper à la paix et la tranquillité de votre propre cachette avec piscine privée. Votre voyage de l'aéroport international d'Orlando vous prendra environ 20 minutes, en route, vous passerez la plupart des grandes attractions que Orlando a à offrir, ainsi que des magasins et des restaurants de renommée mondiale - la localisation de Terra Verde met tout vraiment à votre portée, ce qui rend ce un séjour inoubliable. Notre Villa est une maison de piscine de luxe avec quatre chambres, décorées avec goût, entièrement climatisé, offrant un refuge après ces jours merveilleux dans les parcs, terrains de golf, des aventures de pêche ou des expériences de shopping! Il a une première chambre de maître étage reine, à l'étage il y a une deuxième chambre principale avec un lit king size, la troisième chambre a un lit queen size et la quatrième chambre a des lits jumeaux alors la villa peut accueillir jusqu'à 8 personnes confortablement. Le salon est spacieux avec un plan d'étage ouvert, y compris la salle à manger, bar et cuisine. Il y a un coin salon en plein air sur la véranda (terrasse de la piscine) plein sud, avec inclinables soleil. La propriété villa adossée à une zone de conservation pacifique et est donc sans vis à vis des propriétés à l'arrière. Situé juste à côté de Poinciana Blvd. Il y a un super Walmart à proximité pour tous vos besoins de vacances. Le temps de conduite de Disney est de 8-10 minutes. Pour atteindre Disney vous tournez simplement à droite de la tour de la station à gauche sur 192 et il vous emmènera directement à Disney. La propriété sauvegarde à la terre de conservation de la vie privée dans la zone de la piscine. Notre Clubhouse est plus de 6000 pieds carrés. Communauté de plain-pied dans la spectaculaire piscine, un bar en bord de piscine Tiki, traqué lac de pêche, Cyber ​​Cafe, Arcade, Basket-ball, Volley-Ball, Vie de séjour avec télévision, des sentiers pédestres, Aire de pique nique, aire de jeux Tot Lot, Pétanque et bien plus encore. We have stayed at this property several times and it has never disappointed us. We were very satisfied with our stay. Thank you for the hospitality! Nice, clean home! Great location! Great location, nice resort! Publix and Walmart are convenient to this house. New carpet and appliances, very nice and clean. We were there when it was unseasonably cold, and we could not use the pool (water temp was 76)...would have been nice if the water had been warmer, but it was cold outside as well. Spacious home in a quiet neighborhood. Resort is close to all amusement parks and shopping areas. Folks at the resort were very helpful and the gated community was very quiet and safe. Agnes was extremely helpful answering questions as well allowing me to add a day to our stay due to us getting there earlier than expected. If your looking for an enjoyable and relaxing stay while keeping yourself and family under one roof this is the place to stay. This villa really is beautiful, plenty of parking and the staff at the gate and club house were very helpful. I booked this one as it has a downstairs bedroom and bathroom, ideal for my mother who uses a wheelchair, there is also steps into the pool with a rail so this made all the difference. The villa is very clean and comfortable, kitchen is equipped with all you would need for your stay plus a huge Walmart is literally 5 minutes round the corner so you can never be stuck. The location is ideal for getting to the parks, you have to hire a car, 15 minutes to Disney and half an hour to Universal, we liked that we go to all the hustle and bustle of Orlando but still have the tranquility of the villa and pool to get back to. Agnes was really lovely to deal with whilst booking, clear instructions and very easy to understand so there was no stress when it came to checking in or during our stay as there is a handy manual with all information you would need. The washing machine and dryer really helped with keeping towels fresh and holds a lot so perfect for families. The upstairs has 3 bedrooms (2 double and one with 2 single beds) with 2 bathrooms, this was great as myself and sister could have a bathroom each. I really wouldn't have any problems with booking this villa again in a heartbeat, it beat all my expectations and I'd happily go back tomorrow. We really enjoyed our visit I would definitely stay here again. My grandson and nieces enjoyed the pool. The only problem we had was with instructions with tv. Written instructions weren’t helpful. Did as instructed on tv with still no tv. We had to call for help. Wow!!! Our stay at this property was absolutely amazing!!! It felt as though we were staying in our own home. It is very well maintained and full of all of the amenities that we could possibly want. The decor has a comfortable, slightly tropical feel and all of the appliances are new, high quality models. There were numerous thoughtful touches throughout the home including books to read and DVDs to watch. There were curling irons and hair dryers in each of the bathrooms. The beds were super comfortable, rivaling my own bed at home, which is difficult to find when traveling. The gated community felt very safe and provided a nice quiet retreat after being immersed in all of the noise of the tourist areas of Orlando, which was just a short drive away. During our stay we only had one minor problem and that was with the electronic lock on the front door. When we contacted Agnes and the property manager it was immediately taken care of. This property will definitely be my first choice to stay at the next time that I am in the area. Agnes was absolutely wonderful to work with through the entire process and I could not possibly offer a higher recommendation. 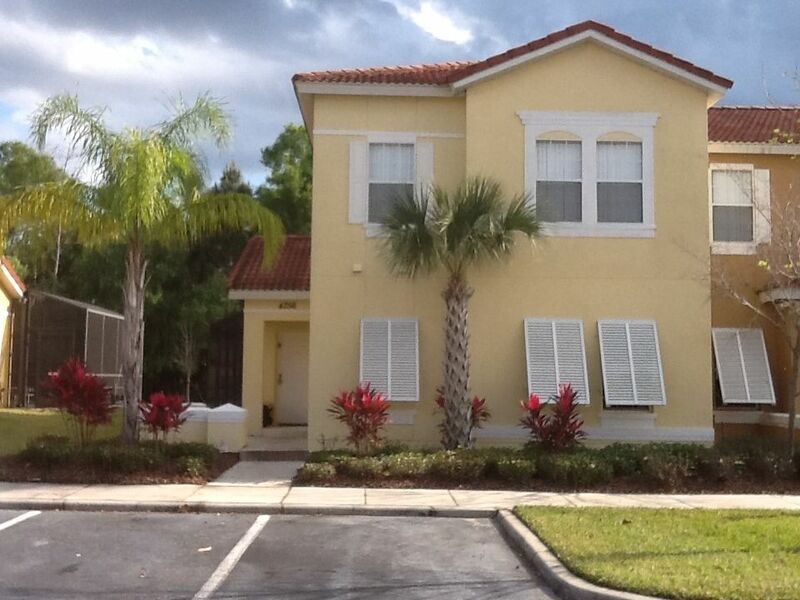 This is THE place to stay in the Orlando/ Kissimmee area. Holiday weeks at a rate of $150 per night, Thanksgiving, Christmas & Easter.